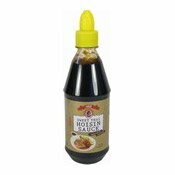 Description: Suree Sweet Thai Hoisin Sauce is a great dipping and marinating sauce for chicken, ducks and ribs. It also adds extra flavour to stir-fry and noodle dishes. Storage: Store in a cool, dry place. Refrigerate after opening and consume within 4 weeks. Ingredients: Sugar (43%), Water (23%), Fermented Soy Bean (22%), Salt (5%), Garlic (3%), Sesame Seed (2%), Thickener (Modified Corn Starch) (1%), Acidity Regulator (Acetic Acid) (0.50%), Natural Colour (Caramel E150c) (0.30%), Spices (Coriander Seed, Chinese Star Anise, Cinnamon) (0.2%).